The Elite series of boom poles from Professional Sound Corporation® represent a no compromise design based on our vast boom pole experience. All Elite boom poles were in essence, designed by you, our customers. The design is a compilation of more than 22 years of customer feedback and suggestions. Each pole is hand crafted in the USA from the finest materials available. The Elite series of boom pole tubes utilize a blend of super high modulus carbon fibers that are precision wound to our specifications by the top carbon fiber specialists in the U.S.A. These high tech tubes provide a delicate balance of strength, stiffness, torsion rigidity and low handling noise. Hundreds of hours went into the design of these carbon fiber masterpieces. After winding, each tube is impregnated with the highest quality resins available and baked under tight, computer controlled temperature and humidity conditions. Each tube is then painstakingly ground to the highest aerospace tolerances. The Elite series of boom poles utilize a system of fixed threaded mounts, locking collars and locking rings in order to offer unparalleled locking characteristics with a simple half turn of the wrist. Smooth, easy use, and years of trouble free service were our initial design criteria. We think you will agree that these locking collars overwhelmingly meet these requirements. Each collar is machined from T6061-T6 billet aircraft aluminum using state of the art computer controlled lathes programmed and operated by a skilled master craftsman with decades of experience. The fixed threaded mounts and locking collars incorporate a debris blocking ring to help keep unwanted material out of the locking mechanism. The locking rings are made from high purity white Delrin for uncompromised performance in any weather condition. Like the locking collars, the Delrin locking rings are machined to super tight tolerances. Each Elite series boom pole is equipped with a removable top screw to allow for quick and easy mounting of your various microphones. These removable top screws are machined from aluminum and anodized for lasting good looks. These top screws also incorporate a clever cable slot for easy and quick screw changes or cable installations. The removable top screws are extensively machined to reduce weight in non-critical areas. Additional top screws are available separately for mounting to all of your microphone shock mounts. All Previous Pole Problems Eliminated! The heel end of the Elite boom poles feature a fixed, lightweight aluminum threaded mount that is compatible with the various end caps available. 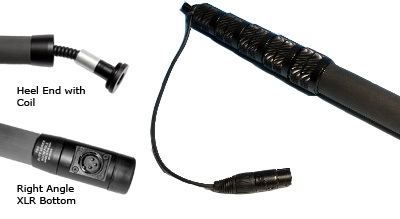 These end caps include a male XLR bottom for use with internal coiled cable assemblies, a right angle XLR bottom for use with internal coiled cables and plug on transmitters, an end cap that incorporates a robust rubber bumper and an end cap that features an easy-flow cable exit for use with straight cables. All of these specialized end caps are machined from aluminum and are thus virtually unbreakable. They do not suffer from pulled and stripped threads as other brands do. PSC Elite Series of Boom Poles.....Simply The Best! FBPS Elite Pole, Small, No Cable 11 oz 1' 7" ** 6' 1"
FBPSCC Elite Pole, Small, Coiled Cable 11 oz 1' 7" ** 6' 1"
FBPSCCRA Elite Pole, Small, Coiled Cable, Right Angle XLR Base 15 oz 1' 9 " 6' 3"
FBPSSC Elite Pole, Small, Straight Cable 11 oz 1' 10" ** 6' 4"
FBPM Elite Pole, Medium, No Cable 14 oz 2' 2" ** 8' 3"
FBPMCC Elite Pole, Medium, Coiled Cable 14 oz 2' 2" ** 8' 3"
FBPMCCRA Elite Pole, Medium, Coiled Cable, Right Angle XLR Base 18 oz 2' 4" 8' 5"
FBPMSC Elite Pole, Medium, Straight Cable 14 oz 2' 5 " 8' 6"
FBPL Elite Pole, Large, No Cable 1 lb 2 oz 3' 12' 4"
FBPLCC Elite Pole, Large, Coiled Cable 1 lb 2 oz 3' 12' 4"
FBPLCCRA Elite Pole, Large, Coiled Cable, Right Angle XLR Base 1 lb 6 oz 3' 2" 12' 6"
FBPLSC Elite Pole, Large, Straight Cable 1 lb 2 oz 3' 3" 12' 7"
FBPXLSC Elite Pole, X-Large, Straight Cable 1 lb 7 oz 4' 3" 17' 3"